It seems like I've been making pasta salad a lot lately. Last week I shared my pesto pasta salad with you, today I'm sharing a new recipe I recently tried, and tonight I'm making my traditional pasta salad for a baby shower/potluck at work tomorrow. It's basic, but delicious, so I'll probably share that one with you too. At least I'm giving you options for your Labor Day festivities, right? And speaking of Labor Day...The pasta salad I'm sharing today is definitely the one I will be serving at our annual cookout this year. I saw this recipe on Deborah's blog a few weeks ago and was instantly intrigued by the flavor combination. Cheddar cheese and grapes? It sounded so unusual, I just couldn't resist giving it a shot. This is an awesome pasta salad. It's flavorful and creamy, and much to my surprise, the flavors all worked perfectly together. If anything, it could have maybe used a little less vinegar -- but then again, the pregnancy has probably just made me extra-sensitive to that flavor. I left out the ham, but I'll definitely add it when I make this for Labor Day; I'm sure it's just delicious in this. It was a big hit in our house, and we're having the leftovers with dinner. Since Deborah says this salad tastes even better the next day, I'm really excited to eat it again tonight! 1. Cook pasta in a large pot of boiling water until al dente. Drain, and rinse in cold water. 2. In a small bowl, mix together mayonnaise, sour cream, cider vinegar, mustard, sugar, black pepper, dill weed, and salt. 3. 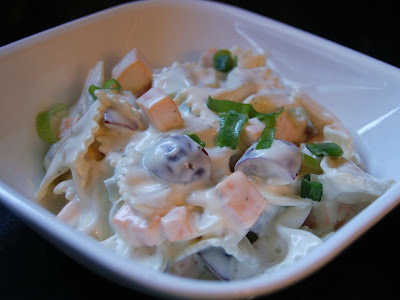 In a large bowl, combine pasta, grapes, ham, green onions, and cheese. Toss with dressing. Cover, and chill overnight or for at least 6 hours. I would leave out the ham so I am glad I get to see it without it. This looks unreal and I want to try it. Some dishes just strike home and this is one of them.